Camp will run Monday, February 18, 2019 through Friday, February 22, 2019. Sessions are daily from 8:00 a.m. to 4 p.m. with after care available until 6:00 p.m. for an Additional $12 per day. 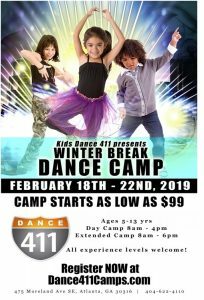 Camp available for ages 5–13, and will be broken into different groups based on volume of students in each age bracket (example 5 – 8, 7 – 9 and 10 – 13). During camp, sessions feature performance training and workshops in varying dance styles including technique , hip hop and jazz and a few specialty classes such as Break Dancing and Step.